Many Dutch descriptions of motion events contain adpositions. Often, the adposition precedes a nominal, in which case it is called a preposition. There are also constructions in which an adposition follows a nominal. This type of construction has puzzled linguists for decades. Its grammatical constituency appears to defy a unified analysis: is the adposition in this type of construction a postposition, or is it a particle? Previous studies, relying on constituency tests such as passivization, topicalization, and auxiliary choice, have left the issue unresolved. 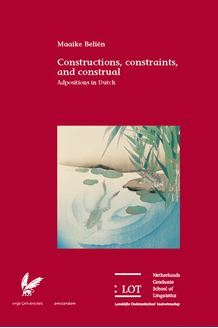 Constructions, constraints, and construal: Adpositions in Dutch offers a new perspective on this long-standing question in Dutch linguistics. Taking a corpus-based, cognitive-linguistic approach, it hypothesizes that the key to the construction’s grammatical constituency lies in an analysis of its semantics. The study therefore presents an analysis of the semantic differences between this type of construction and constructions with prepositions. It concludes that the adposition following a nominal is a particle: it is part of a complex separable verb that takes a certain type of direct object. This study is of interest to anyone concerned with adpositions (prepositions, postpositions, particles), grammatical constituency, lexical and constructional semantics, or the coding of motion events.